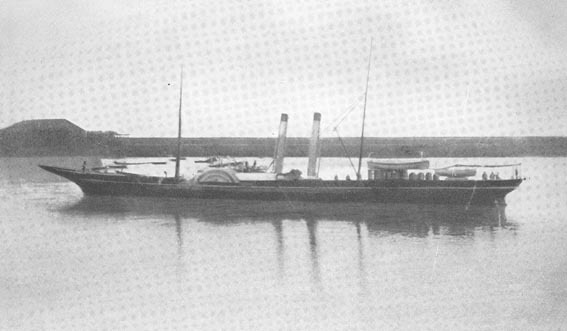 Cygnus - The North of Europe Steam Navigation Company. Built by: James Henderson & Son, Renfrew. Machinery: Built by McNab & Clark, Greenock. Simple oscillating 2cly 120 nhp. Decks: Two funnels abaft paddle boxes. Two masts. Registered: 10th October 1854 at London by Wm. S. Andrews. Other info: On the Harwich / Antwerp service. History: Built for The North of Europe Steam Navigation Co. London. 23rd September 1854. Sailed from Greenock to Gareloch, after having her machinery completed, to have her compasses adjusted. She returned later that day. 2nd October 1854. Arrived at Lowestoft from Greenock. 21st October 1854. Sailed from Lowestoft for Tonning. October 1854. Chartered to King Frederick VII of Denmark as royal yacht for opening of first train ferry passenger service in Denmark. 9th November 1854. Due to the storms off Lowestoft she put back and took refuge in the harbour. She was on route for Grimsby. Captain Raymond. 27th July 1856. Arrived at Lowestoft from Flensberg, Captain Schwenson. 22nd August 1856. Collided with the smack ‘Alarm’, while in transit between Thames Haven and Ramsgate. The ‘Alarm’ capsized, all crew saved. 1856. Laid up in Lowestoft. 16th March 1857. A compensation claim was made against the North of Europe Steam Navigation Company for the injuries sustained in the collision between the ‘Cygnus’ and the ‘Alarm’.. The claim was made in favour of the plaintiff’s behalf, and gave judgment for £50. 7th April 1857. Went into Lowestoft Dock. 9th April 1857. Taken out from Lowestoft Dock. 11th April 1857. Made a trial trip and averaged from 12 to 14 knots per hour. 13th April 1857. Sailed from Lowestoft, Captain Mann, for Weymouth. 15th May 1857. Chartered by the Weymouth and Channel Islands Steam Packet Company for eighteen months. 1857. Owned by Weymouth & Channel Islands Steam Packet Co. London. 1874. Boiler and cylinders replaced. 1883. Given a whaleback forecastle in refit. 1889. Owned by Alfred Tolhurst, London. Intended for Thames excursion work, but resold for Liverpool-Douglas service. 1889. Owned by T. Holden, Southport. 1891. Owned by David MacBrayne, Glasgow. 1892. Extensive alterations: new bow, reboilered, one funnel, and renamed ‘BRIGADIER’. 7th December 1896. Wrecked on Duncans Rock near Rodel, Isle of Harris., all passengers and crew saved.